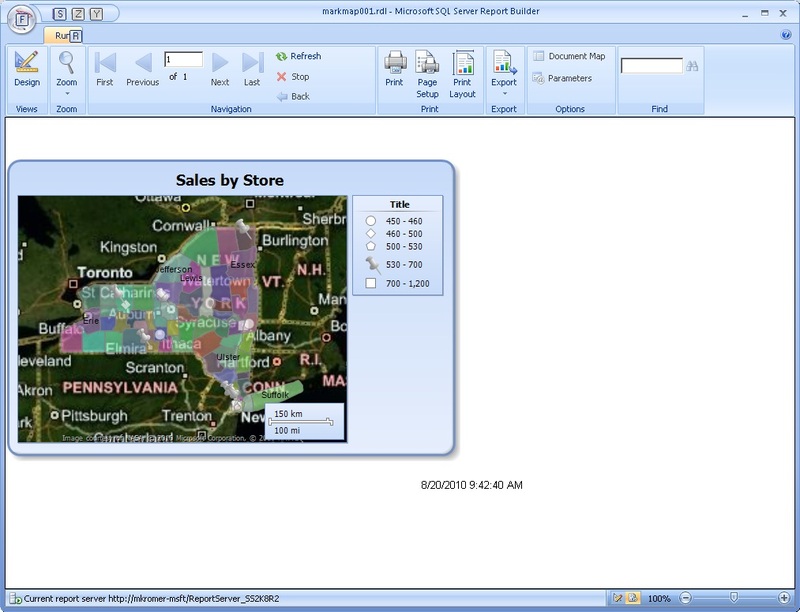 World map separeted by countries, able to join Map Gallery in Reporting Services inside SQL Server 2008 R2. Join us, and make your country in this world map. By default, only USA maps came with Reporting Services. This proposal is make a world map to use for all in Reporting Services. How EZ are Bing Maps in SSRS 2008 R2? IMHO, ridiculously easy using Report Builder 3.0. I put this together in 10 minutes by using this Microsoft tutorial that shows you how to take geospatial data, link it to analytical data and display it on a map, overlay Bing Maps and visualize data points for awesome BI dashboards. What you will notice right away from my screenshot below is that I am not a graphic artist! But this is an awesome point in a visualization project to get to quickly and then modify the details as you need for your project. Keep in mind, though, if you walk through that tutorial on your own as well, is that it is a bit of a cheat because the code in the tutorial wraps-up the geography points together with the analytical data for displaying points in the SELECT query instead of pulling the data from a data source. You would likely never do this in the real world. Instead, what you will do is take the points from your geospatial data and your BI data from a DW or cube and then link it in the Reporting Builder Maps Wizard.